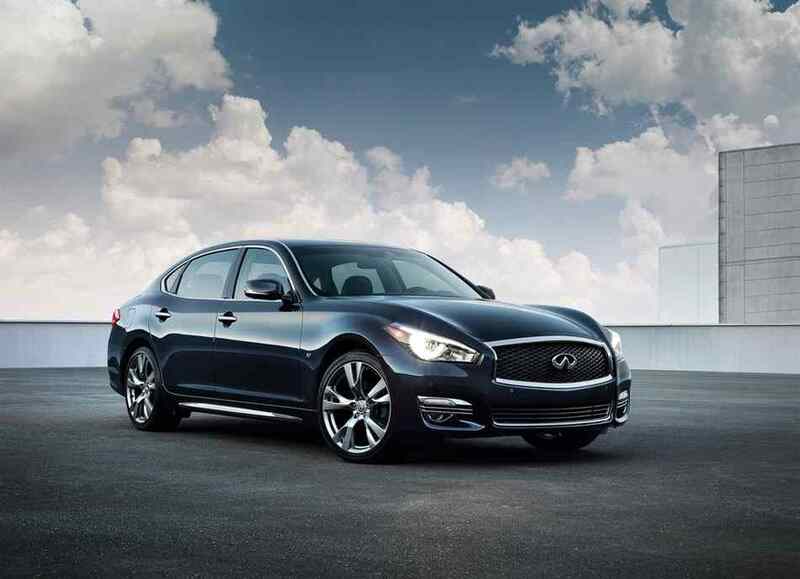 Make every ride exhilarating in the new 2019 Infiniti Q70L! The Q70L gives you two options of available engines to choose from – the 3.7-Litre V6 for 330-Horsepower, or the 5.6-Litre V8 for 416-Horsepower. Plus, with Variable Valve Event and Lift (VVEL) Technology, both engines are geared for immediate response. Heighten your control even further with standard Infiniti Driver Assist Technologies, such as Intelligent All-Wheel-Drive, an Around View Monitor with Moving Object Detection, Vehicle Dynamic Control with Traction Control, Forward Emergency Braking with Forward Collision Warning, Back Collision Intervention with Rear Cross Traffic Alert, Lane Departure Warning / Prevention, and Blind Spot Warning / Intervention. Now, step inside to a meticulously crafted and spacious interior. With the Infiniti Intelligent Key, the Q70L recognizes you instantly! Plus, it remembers your driver’s seat, steering wheel, and side-view mirror positions. The Q70L also adjusts Audio, Climate and Navigation Settings to suit your exact preferences. In addition, the Q70L ensures all your journeys are relaxed with Semi-Aniline Leather Seats with a Unique Quilted Seat Pattern, White Ash Silver-Powdered Wood Trim, and Suede-Like Headliner. Add in a Heated Leather-Wrapped Steering Wheel and Leather-Wrapped Shift Knob, and your drive just gets better! The Q70L also comes equipped with the Bose Premium Studio Surround System, including Digital 5.1 Channel Decoding and 16-Speakers! You will also be able to enjoy Bluetooth Wireless Technology, USB Connectivity, plus complimentary 90-Day Trial Access to SiriusXM Satellite Radio! A long wheel base also enhances the Q70L’s impressive exterior side profile. Add in 18 x 8.0 Inch Triple Split 5-Spoke Alloy Wheels, LED Fog Lights, Automatic On/Off LED Headlights, a Power Rear Sunshade, plus a Power Sliding Tinted Glass Moonroof, and the Q70L raises the bar on what a luxury vehicle should be! If you would like more information about the Infiniti Q70L, please feel free to stop by and visit us at Guelph Infiniti, or alternatively browse our Website to see our 2019 Q70L Online Inventory!